Letter recognition is the first key to unlocking reading and writing fluency. Help your little one develop the fundamental skills to read, write, and sequence letters with our wide selection of printable alphabet worksheets. 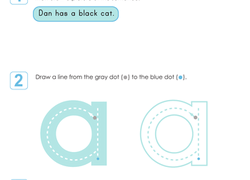 Get your child started with fun coloring and connect-the-dot pages, and watch them work their way up to vowel recognition, identifying missing letters, and writing out their first written words! There is nothing quite like the pure joy that’s expressed on the faces of young children when they finally master the 26 letters of the alphabet. That joy filters down to parents and loved ones, too, because it’s the telltale sign that the youngster has unlocked the door to literacy. Our alphabet worksheets are intended to help push your child through that door with a variety of exercises that enlighten and entertain at the same time. To speed up the process even more, try some of these at-home ABC games: Put a bunch of fruit in a bowl and see if he can identify the items that start with various letters, like A (apple), B (banana), G (grapes), P (peach), etc. Place a handful of pieces of alphabet-themed cereal on the table, call out letters at random, and see if he can spot them. If that’s too easy of a challenge, grab a timer and see how long it takes him to put the pieces in alphabetical order. Hold up familiar objects—like a pencil, book, fork, or glass—and see if he can tell you the first and last letters of each object.